Our product range includes a wide range of turn table. Fostered with immense years of industry experience and market understanding, we are offering a wide gamut of Turn Table. 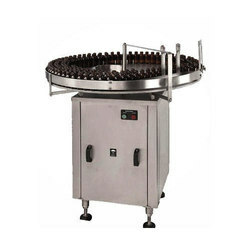 The offered machine is used for packaging and bottle filling application. Its fabrication process is carried out under the expert supervision of our skilled professionals who utilize the finest grade basic material and advanced technology. Widely used in varied industries, this machine is offered at very reasonable price to the clients. Stainless steel scrambler & Un scrambler, which is familiar as turn table. This is built on SS square frame, solid guide rail & reduction gear box for jerk less & noiseless performance. Turntable is useful to ensure total synchronization, uniform flow of container and to take a turn at 90 degree to suit different machine and purpose in automatic liquid line. In all the automatic machines requiring stand by bottles to get filled. Power Characteristics**	0.5 HP/415 V/50 Hz.